Hi everyone! Here's another card I made for the creative crew challenges on splitcoast stampers. 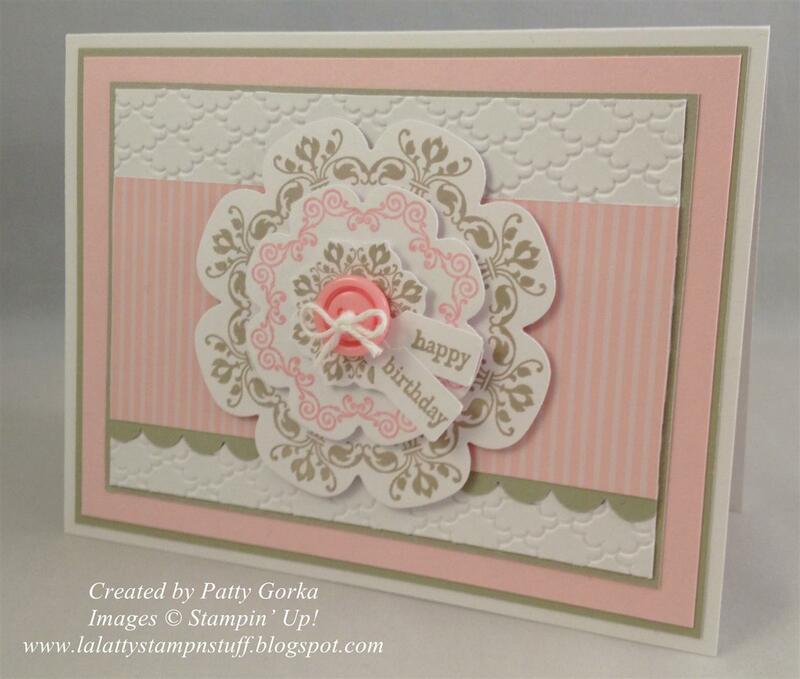 The creative crew challenge I made my card for was to use the Daydream Medallions stamp set. I also made this card for this week's ABC challenges which is an anything goes challenge. Come play along with us! I stamped the images and cut them out using the floral frames framelits. I layered them using dimensionals and I finished off my flower using a button tied with a twine bow and my sentiment which was stamped and punched out using my jewelry tag punch. My background is dry embossed using my fancy fan embossing folder and I punched the sahara sand layer using my scallop border punch. And that's about it for my card; the rest of it was just a matter of putting it all together. Thanks so much for stopping by! This is very lovely, Patty. The colors are soft and perfect for a spring birthday, Mother's Day, or even Easter. Very versatile design! what a great card patty so pretty. Pretty, pretty! Love those soft colors together. The embossing is to die for. Love that stamp set you used too. Another beautiful card. 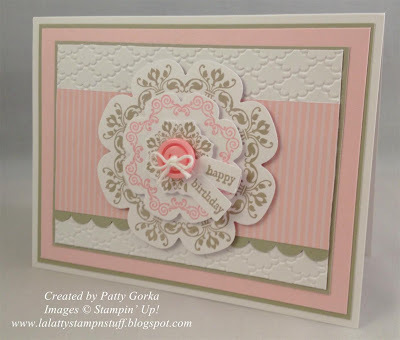 Love the embossing and beautiful soft colors. Patty your cards are always so pretty.